Buying Property in Cyprus is a great investment choice and we discuss various aspects. 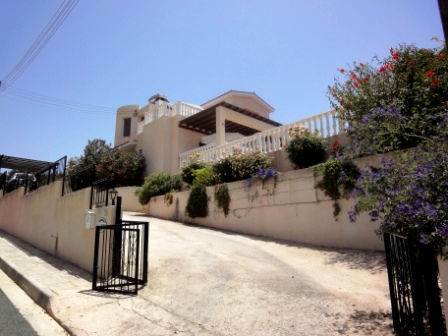 Tala, Paphos - This 3 bedroom detached villa is situated in a quiet residential cul-de-sac in the foothills of the Kamares/Tala region. The popular traditional village square of Tala, with it’s quaint stone church and good variety of tavernas, coffee shops and restaurants is nearby. A long driveway leads up to a car port and the front entrance to the property. Walking in to the spacious entrance foyer there is a hallway in front to a downstairs bedroom and shower room. To the right is a comfortable living room with feature open fireplace, and attractive archway to the good size kitchen and dining area. Patio doors in the lounge, and a door from the kitchen, provide easy access to the outside covered veranda with balustrade. Upstairs there is a large landing with space to use as a small study area, or to install a small kitchenette. Patio doors open onto a good size balcony with fantastic sea and mountain views. The master bedroom and second bedroom both have en-suite facilities, and the balcony can also be accessed from the master bedroom via patio doors. Outside, steps lead down from the covered veranda to the swimming pool terrace with pool shower. Ideal for outdoor dining and entertaining is the purpose built kitchen/bar including a traditional barbecue and fitted sink. There is provision for gas, for those who prefer to use this method for cooking. An additional feature of this property is the basement room which can be used as a study/office, games room, workshop, fourth bedroom or simply for storage. The property is in excellent condition and has full title deeds avalable. It is being offer fully furnished and represents excellent value for money. NOW SOLD! Spacious 3 bed townhouse in Chloraka w/ Deeds - Walk to the Beach! Only 136,000 Euros! Cyprus Property is Hot! Now more than ever. There are over 20 million northern Europeans (European baby boomers) that have retired in the last few years which is a great number and many will be British. Many have been waiting for the financial crisis to past before they make the move to Cyprus. With warm weather, low crime rate, low cost of living in Cyprus and English speaking population, do you think Cyprus will have enough properties for every one?